All images supplied by ADPR. British luxury motor yacht manufacturer, Fairline Yachts, will take its revival to another level during its 50th anniversary year as it showcases the new Targa 63 GTO, the first Alberto Mancini-designed Fairline, to the US for the first time at the United States Powerboat Show in Annapolis, hot on the heels of its worldwide debut at Cannes Yachting Festival in September. The Targa 63 GTO was announced in the summer of 2016 to great excitement from motor yacht enthusiasts across the globe, as the world waited for the first glimpse of the highly-coveted 63-footer. This is the first of the new generation of models from Fairline Yachts, aptly launched during Fairline’s ‘golden year’ with the brand celebrating 50 years of boat building. Featuring the world-class combination of Mancini’s stunning Italian styling, rigorous and proven naval architecture by renowned Dutch firm Vripack and the hand-crafted, made in Great Britain quality of Fairline’s passionate and skilled craftsmen, the Targa 63 GTO is set to take centre stage. Visitors to the Fairline booth will not only be able to experience the brand new Targa 63 GTO, but also three other Fairline models, including the Squadron 48, the Targa 48 GT and the Squadron 65. Combining the luxury of a spacious, sociable upper deck with a well-appointed helm station and twin seats, the Targa 48 GT enables you to share the thrill of discovery in comfort. Technologies come as standard, such as the electric, hard-top roof, coupled with panelled glazing. With one elegant sweep, the Targa 48 GT’s newly-designed hull windows let sunlight flood in, whilst its powerful IPS engines deliver an agile performance that responds to the thrill of the journey ahead – wherever it may take you. 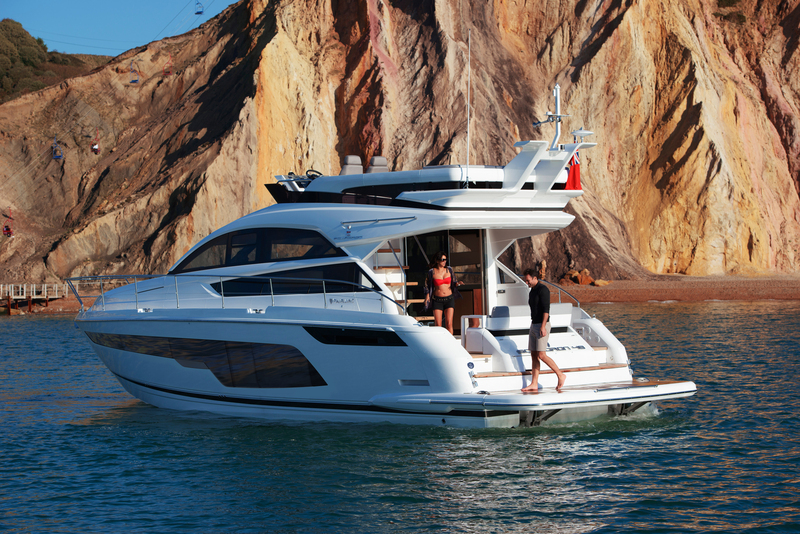 The impressive Squadron 48 personifies Fairline’s relentless pursuit of design excellence. Its expansive flybridge creates a truly sociable environment with a large seating area around a dining table that can be lowered to convert into a sunpad, forward-facing seating alongside the upper helm, and a submersible bathing platform which offers a spectacular way to enjoy the water. With a total length of 50ft 8in and a beam length of 14ft 2in, the Squadron 48 offers IPS power of up to 1100mhp and speeds in excess of 30 knots – while still providing a cruise speed of 26 knots for a range of 260 nautical miles. Luxurious furnishings and hand-worked cabinetry are hallmarks of the Squadron range and nowhere is it more elegantly expressed than in the latest Squadron 65, which features a new foredeck entertaining area offering uninterrupted sea views, spacious seating and sunbeds, dining table and sky canopy. Everything about the newly designed Squadron 65 epitomises refined, uncomplicated, single-floor living that’s usually the territory of a much larger yacht – from the free-flowing saloon area to the generously proportioned and well-equipped galley – both of which also boast a newly-designed layout that maximises the sense of space on-board. Authorised Fairline dealers Total Marine of Norwalk and Chesapeake will be in attendance throughout the United States Powerboat Show, together with key personnel from Fairline’s design and manufacturing teams to provide visitors with in-depth information about the company and its ranges going into the 2018 season.